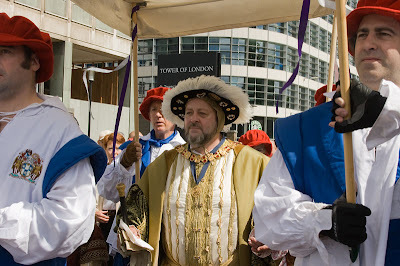 The King leaves Tower Hill to be rowed up the Thames to Hampton Court. (his favourite palace). The last time he made this trip was 500 years ago! Why didn't they ask Jonathan Rhys Meyers to take part in the historical costume parade? I love the costumes! Whatever this was about, it looks grand. I've been following your blog for a while and I just love your photos. Thanks for checking out my Blog and leaving a comment ... I started last month and it's good to know people are checking it out, even if it is in Portuguese only (so far ...). What would he think of the changes to his fine city if he really did show up for a quick visit? wow , this a costume i wouln't wear , this man was a little bit bloodthirsty ;) But beautiful reconstructrion ! Thanks for adding me to your blog roll and I have done the same. Gee, I wish I had a favourite palace. Then again, it's so difficult to choose! Fantastic! I didn't know about this...I'm a big fan of the Tudors, although Henry VIII is not my favourite. Ciao. A.